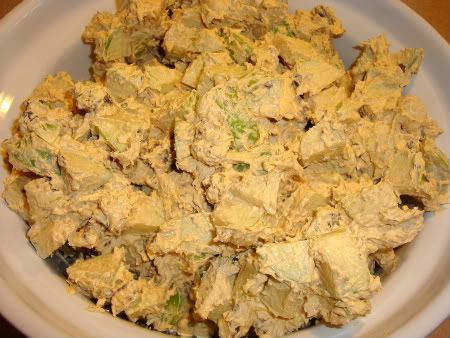 This recipe–compliments of my sister Amy–is the perfect summer salad! It’s incredibly easy to make, and oh-so-delicious. It tastes just like a caramel candied apple! Chop up about 5 large, crunchy apples into bite-sized pieces. 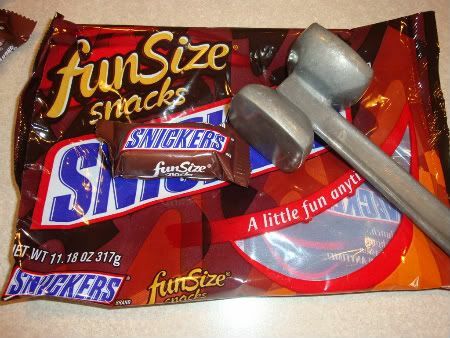 Add Snickers pieces–about 8-10 snack sized Snickers bars are good. Mix 1 package of butterscotch instant pudding mix (just the powder) with 1 small container of Cool Whip. 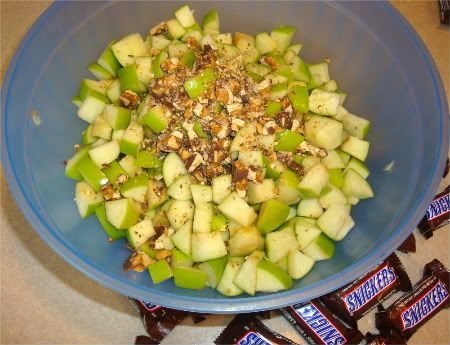 Add this to your big bowl of apples and Snickers, and mix it all together. And that’s all it takes! Quick, easy, and sure to be a hit. 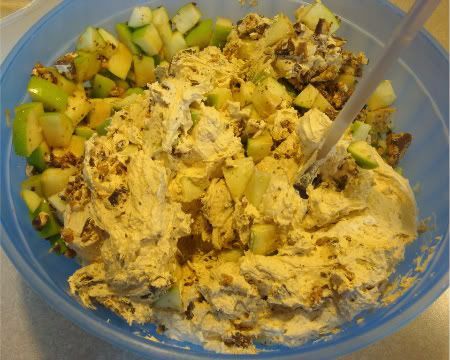 I don’t even like apples, but I love this recipe. Give it a try and let me know what you think! Wow!! This will be on my menu this weekend! Thanks! I LOVE this salad! It is one of my favs but I use the french vanilla pudding mix because I am not a butterscotch fan and it still tastes just as yummy!!!! i am so doing this some time! lovee it. it looks delicious! thanks for sharing! Oh my! That looks so amazing!!! I must try it out. oh my gosh, that is the yummiest thing I’ve seen in a long time! Thats what I am talking about, a salad thats a dessert! Sign me up. I just had this for the first time this week (minus the pudding mix.) It was so good! You’re blog is too adorable! I’m trying to get OVER my candy addiction. This will not help. Esp. since I have a basket full of Granny Smiths just waiting to be candified. Perfect! I needed something to make that was quick and easy for my bunco party tonight! I’m so going to make this! Seriously, sounds AMAZING! I LOVE IT! SALAD – so that means its “healthy” right? This might be the only salad my kids will eat this summer! Serious Yum! Thanks for posting! You are a monster. OMG this looks delish! Isn’t that stuff awesome! I love it but haven’t made it in forever. this literally made me salivate.